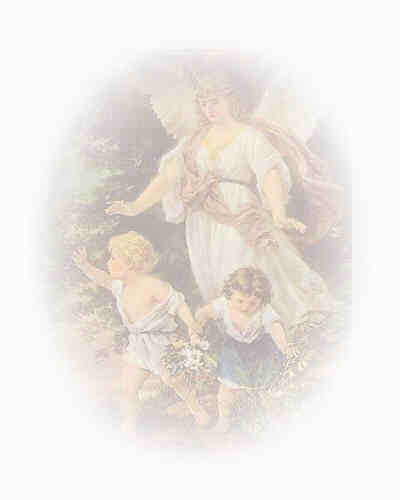 "Three little angels with wings gossamer white, watch over babies sweet and hover in the night." Ciadil looked over her charge, he was a sweet boy, this little one with hair the color of cinnamon. She was not above taking a bit of pride in his sweet smile and the adorable way he tucked his fist under his cheek when he slept. "Peace filled dreams tiny one." She pressed her finger into the little place just under his nose and left the dent there to prove her connection was complete. This boy was special. She was honored to be his guardian. She had watched his tender mother through her struggles carrying his tiny body and now his protection was in her care. "Remember when we talked about this little one? How you understood that there would be difficulties ahead?" A tear slipped down her perfect angel cheek and fell on the tube that disappeared into his nose and down through his lungs. It was so hard for Ciadil to watch his struggles even with her perfect knowledge, and struggle he did. "Three months early is only a moment at home baby, I know. But here, it seems so very much longer." She looked over at the grandmother with her face in her hands. How she wished she could kiss that brow like she could that of her delicate charge, and take some of the grief and replace it with peace. "Just a small moment, it is just a moment!" 'Cia did what she could, whispering to the older woman and winding her wings around the slumped shoulders, offering the gentle brush of her gossamer comfort to the woman in such suffering. How she wished she could do more. "Now Cia, you know that this will pass." Dilcia chided her sister. She was the practical one, always telling her what was best and how things should be. Sometimes Cia appreciated Dil's strength, but today she just wanted to be left alone. "Stay back far enough, you know what happens if you lose your feathers." "It isn't fair!" Cia exclaimed. "He is so tiny!" She glared back at the other angel with a defiance that reached across the veils that separated them from the sight of the human world. The grandmother shivered at the change in the room. "You knew life wouldn't be fair when you took this assignment." Dil wasn't giving an inch. She had done her job far too well for far too many years to let one more grief stricken parent get to her. "You know it always turns out for the best in the end. There is no use being upset about it" Ciadil never could understand why things had to be this way. It seemed to her to defy logic. When the Master could make everything perfect, why did he allow such pain to be experienced? She backed away so that none of her feathers would be lost. Such a thing would make her subject to the will of whoever captured it, and most often that tipped the balance of how things were supposed to be. Seldom was it for the best in the long run. The Master knew what each person needed and following his plan was why they were there. Still there was always choice. The little child was moving, he sputtered and gasped and the mechanical devices hooked to him began to squeal. The grandmother was on her feet in a second and nurses came running. Cia hovered in the corner, she didn't want to watch. She had thought this would be a long term assignment and now it seemed that she had barely begun and it was to be over. Dilcia's charge was much more fortunate. He slept quietly though he too was tiny. The little chest moved up and down rhythmically almost hypnotizing the watcher into a peaceful reverie. This child was a strong one. He had been a great leader in their previous home. He had learned many lessons about struggle and had overcome much just to be where he was now. She was glad for him, he deserved a little peace. It must be nice to not to have to make decisions, to not be responsible for awhile Cia mused. The little boy in the incubator was being attended to by six nurses and doctors. His little feet were rubbed and his heart massaged. He was having his third blood transfusion, and the mechanical lung pumped oxygen into him steadily. Suddenly he jerked, and went still. Cia covered her face with her wings. This was it. . . One by one, the doctors and nurses removed the apparatus' and unhooked the doll sized body from the technology. The mother and father had come into the room, and were sobbing in each others arms. Cia wondered if there was something she could do now. It seemed her job was finished. She looked over at the still little boy once more, and was surprised to see Dil leaning close over the baby's face. Practical matter of face Dil, was not giving up! She was breathing heavenly air into the little body. Over and over she pushed her lips over the baby's till his lungs began to rise and fall. The grandmother came over for a look and lifted the boy's minuscule hand in her own placing her finger in the center. Cia could be mistaken, but she thought she saw those little fingers close! In a flurry, she too was at the bedside. She rubbed the tiny chest as Dil moved back away, sure enough. . . it was rising and falling by itself! will send e-mail directly to me! If you enjoyed it here, please click the banner below. Thank you.